Commercial Web search engines such as Google, Yahoo, and Bing are used every day by millions of people across the globe. With their ever-growing refinement and usage, it has become increasingly difficult for academic researchers to keep up with the collection sizes and other critical research issues related to Web search, which has created a divide between the information retrieval research being done within academia and industry. Such large collections pose a new set of challenges for information retrieval researchers. In this work, Metzler describes highly effective information retrieval models for both smaller, classical data sets, and larger Web collections. In a shift away from heuristic, hand-tuned ranking functions and complex probabilistic models, he presents feature-based retrieval models. The Markov random field model he details goes beyond the traditional yet ill-suited bag of words assumption in two ways. First, the model can easily exploit various types of dependencies that exist between query terms, eliminating the term independence assumption that often accompanies bag of words models. Second, arbitrary textual or non-textual features can be used within the model. As he shows, combining term dependencies and arbitrary features results in a very robust, powerful retrieval model. In addition, he describes several extensions, such as an automatic feature selection algorithm and a query expansion framework. The resulting model and extensions provide a flexible framework for highly effective retrieval across a wide range of tasks and data sets. 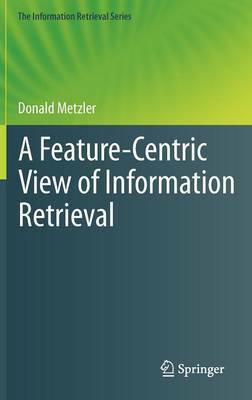 A Feature-Centric View of Information Retrieval provides graduate students, as well as academic and industrial researchers in the fields of information retrieval and Web search with a modern perspective on information retrieval modeling and Web searches.